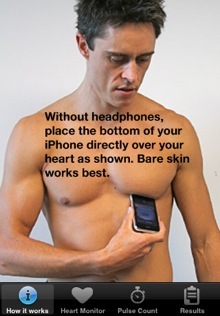 Use iPhone Heart Monitor to quickly find your heart rate. 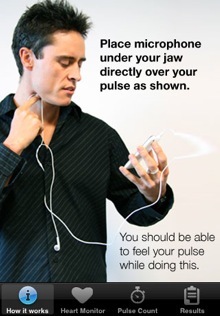 It uses the inbuilt microphone on your iPhone 3G or headphone microphone to listen to and detect your heart beats. It can be used to find your resting heart rate (a good measure of fitness), track how your heart rate changes and check your heart rate immediately after training. Because Heart Monitor uses sound to detect heart rates, you can use the iPhone 3G directly over your heart or directly on the pulse in your neck or wrist. Heart Monitor works best in quiet areas. You can get excellent results when using the microphone on your headphone cable. iPhone Heart Monitor does require a small amount of skill by the operator to place the microphone correctly over the heart or pulse for it to work correctly. 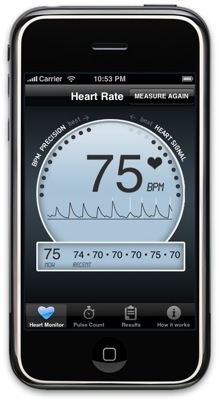 Disclaimer: iPhone Heart Monitor is NOT a medical device and should not be used as one.